Adobe will start renting Photoshop and other of its flagship products from $35 per month on a subscription basis, the company on Monday announced. The applications will be part of Adobe's new Creative Suite 5.5 (CS5.5), which is set to arrive in the next 30 days, the company says. Adobe Creative Suite 5.5 is a mid-cycle update with substantial upgrades to several products, including Photoshop, InDesign, Dreamweaver, Flash Professional, Premiere Pro, and After Effects. The new software comes in several packages, designed for different jobs, such as layout, Web design, and video and audio production (see MacWorld's breakdown of what's new in each CS5.5 package, and Adobe's video tours). As usual, Adobe's new products don't come cheap: $2600 for the CS5.5 Master Collection, $1900 for the CS5.5 Design Premium, $1800 for the CS5.5 Web Premium, $1700 for the CS5.5 Production Premium, and $1300 for CS5.5 Design Standard (upgrade pricing and volume licensing are available). 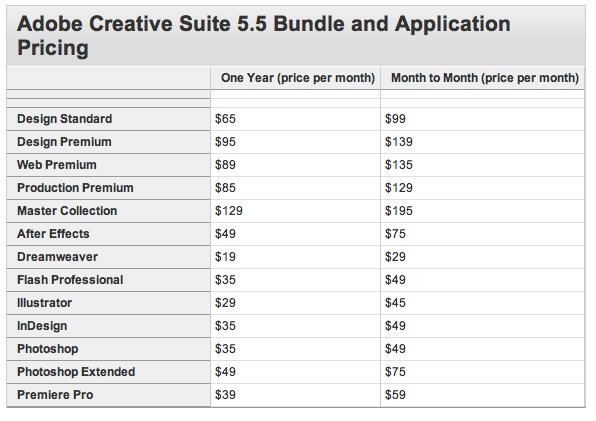 You can still buy Photoshop CS5.5 individually ($700 for Standard, or $1000 for the Extended version), but Adobe is introducing subscriptions for its software, which allow users to basically rent Photoshop or certain software packs on a monthly basis. A Photoshop subscription will set you back from $35 per month while the Design Premium suite comes in at $95 per month, or you can choose a $129 monthly subscription for the Master Collection. These prices are based on a one-year subscription bundle, which is less expensive than renting on a month-by month basis (for example, $99 per month for Photoshop on a rolling subscription). Regardless of the type of subscription you might choose, payments will be taken monthly. Adobe will check the status of the subscription every 30 days, and if the card on file is valid, you get billed and receive an extra 30 days of use. A five-day grace period will be available for when subscriptions are cancelled or cards are declined. The software is delivered via download, with or without a backup DVD. At $35 per month (with one-year subscription plan), it would take you 20 months to pay for the full price of Photoshop ($700, as sold individually). However, the advantage of renting Photoshop (or any of the available software suites) is that you will always have the latest version of the software. This is especially important, as Adobe also signaled a new strategy to update is software more often than usual (every 12 months, instead of 18 to 24 months).